This book mostly talked about what the Sun does for our planet, but also about what it can do for other ones too. The Sun is very famous. Both Mercury and Pluto acted childish. Neptune and Uranus were both sort of shy. Earth was “down to earth,” really. All the other planets really acted just like people. I enjoyed the book because of its humor. Rather than being based on just straight forward facts, it tells truthful facts in a fun and creative way. 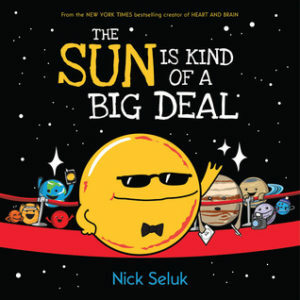 I would recommend this book to children first learning about the solar system. Tags: astronomy, Jedi Calder, Nick Seluk, solar system, Student Reviews, sun.